Proofs don’t have to be complicated, and they don’t have to resolve conflicting evidence. They don’t have to include indirect evidence, either, even though it may be present and could be included to support an argument. Sometimes multiple pieces of direct evidence support a genealogical conclusion. They all answer the genealogy question directly. As promised in the last Ten-Minute Methodology post on proofs here is an example from a published work. Michael Hait, CG, presents a narrative proof in an introduction to a genealogical summary published in the National Genealogical Society Quarterly. His article, excerpted here, treats a family of slave and newly manumitted Ridgelys, Caroline and her three children. While Michael presents kinship evidence for all three children, our focus in this post is on Augustus. What proof is there for his relationship to Caroline? How is that proof presented to readers? Victoire, mentioned in the first paragraph of this excerpt (p. 248), was Caroline’s owner. Direct evidence showing that Augustus was Caroline’s son is highlighted on p. 249. The first item of a two-bullet list (highlighted, p. 250) includes additional direct evidence. There is no indication if Augustus’s baptism record (p. 249, paragraph 1) names his mother. The 1860 census shows Augustus in Caroline’s household (p. 250, paragraph 3), but does not provide direct evidence of kinship. The genealogical summary that begins at the bottom of page 250 offers a picture of Caroline, her children, and her grandchildren. Augustus’s sketch offers no new evidence of his relationship to his mother. Michael Hait, “In the Shadow of Rebellions: Maryland Ridgelys in Slavery and Freedom,” National Genealogical Society Quarterly 100 (December 2012): 245-66, reprinted by permission. The article is available online at Michael’s website. 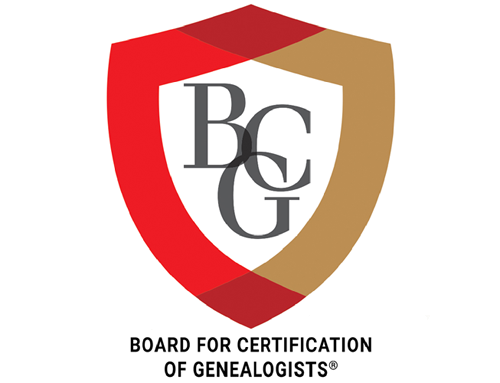 CG, Certified Genealogist, CGL, and Certified Genealogical Lecturer are service marks of the Board for Certification of Genealogists, used under license by Board-certified genealogists after periodic competency evaluation, and the board name is registered in the US Patent & Trademark Office.